Here’s a poem and poet with a mystery. “Red Rooster” was written in 1917. It’s an Imagist poem, a good example of how this pioneering school of poetic Modernism might present things directly, without nearly as much scholarly allusion as later Modernism was prone too. So, immense promise, now an assay of genius—though Lowell also cautions that within the collection “Inadequate lines not infrequently jar a total effect…” That first book went through at least seven printings and two other poetry collections followed shortly thereafter. Go ahead, drop down to the bottom and listen to “Red Rooster” now. It’ll be interesting to encounter it before you know more about the author. Who was the author, the poet with the mystery attached? Hilda Conkling. How come you (likely) haven’t heard of her? Well, we discussed “Donald Hall’s law” here last year. Hall said that most poets, even most poets who win awards and are published in the usual ways, are forgotten by 20 years after their death. There’s that. And Conkling had a short career, no more new poems from her after 1924, though she lived until 1986. But here’s the most significant reason: Conkling wrote “Red Rooster” when she was seven, her first collection was published when she was ten, as her output was already dropping off, and she gave up creating poetry entirely at age fourteen. A teenaged poetic legend like Arthur Rimbaud would be Sophocles writing Oedipus at Colonus in comparison. Both Lowell and Monroe considered Conkling’s age, and both thought the case of Hilda Conkling might tell us something about childhood and poetic genius. The case for pre-adolescent children creating art has been argued a great deal since then. Art critic Herbert Read encouraged thorough arts education for school-children in the 1940s. Kenneth Koch taught classes where children were exposed to poetry and urged to write it. Koch wrote a couple of books to encourage this in the 1970s, and by that time the idea of arts for children was spreading out generally. In the early 1980s Dave Moore and I had heard so much of this that Dave (raising a precocious Hilda-aged child himself at that time) wrote an LYL Band song called “Kids” where the indignant child artists claimed, “we’re the natural poets, so shut up…” But despite that subsequent educational movement, Hilda Conkling is still a strange case: she started at age four, by the story, spontaneously, not as a pre-school exercise. Her father left Hilda’s mother around the same time, and Hilda told her mother that she’d composed a poem, which she then recited to her as a gift. The poems over the next decade followed the same process. Hilda’s mother was a writer and college literature professor who had exposed Hilda to books and music from an early age. One assumes Hilda learned to write later in childhood, but she would always recite each new poem to her mother, who would write them down. Your first thought may be same as mine, that Hilda’s mother composed or helped to compose the poems. That’s possible, even probable, though the mother denied this, and said Hilda was always careful to correct any mistaken transcriptions. Amy Lowell deals with the issue by pointing out the childish elements in some of the poems as proof that they were genuine. But that speaks not at all to the idea that the mother improved or regularized the poems, or that some poems, even if they had a germ of an idea from the daughter, had elements that the literature professor mother further developed. It’s not hard to imagine an aiming-to-please daughter accepting some of what the mother transcribed and read back to her, even if it wasn’t what she had said, because she liked her mother’s changes, or didn’t want to disappoint or displease her. The other accepted plot point in this story is that Hilda’s mother asked Hilda to write down her poems herself as Hilda turned 14, and then Hilda’s poetry stopped. That argues for the importance of the collaboration both as motivation and as conscious or unconscious editorial assistance. There are theories that Hilda may have had a disability which made writing her poems down difficult for her, but no additional life-evidence is offered to indicate that. The suggestion that Philistine and patriarchal society may have pressed the creativity out of the child has been offered. No one seems to have considered that Hilda might have continued to write poetry after age 14 but kept it to herself (a not-uncommon teen-age practice). So much to wonder and doubt in this story—but we’re left with the best of the Conkling poems, such as “Red Rooster.” Could what’s good in it be unintentional? In the opening observation of the rooster, the metaphors have just the right taste (comparing the irradiance of the bird’s feathers to wet rocks and to boat hulls seen through water). The poem’s turn and development in the last few lines seems even more remarkable. 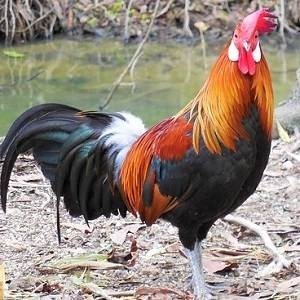 The rooster as symbol of masculinity is time-honored, but we’re ¾ way through the poem before we leave objective and immediate observation to have the rooster characterized as both proud and foolish, and foolish like unto Joseph leaving his family with his “coat of many colors.” The concluding couplet is just great poetic invective. Did a seven-year-old write that, intuiting not just the nature of the conflict in her home, but a vibrant, time-resonating metaphor for it? Was Hilda a 20th Century Mozart, or a prolific creator that sometimes landed a lucky strike? Or was it help from a wronged-by-a-man ghostwriter/mom? As a reader I don’t care. “Red Rooster” doesn’t read as unintentional, as a random combination—but then again, we readers are great pattern-seers, as anyone who’s worked with things like automatic writing or cut-up discovers. My best guess is collaboration, a child and an adult seeing and sharing the world together. That, like this poem, could be extraordinary too. Here’s my performance of “Red Rooster.” Give a listen to it with the player below.